"Central Intelligence is a 2016 American action comedy film directed by Rawson Marshall Thurber and written by Thurber, Ike Barinholtz and David Stassen. 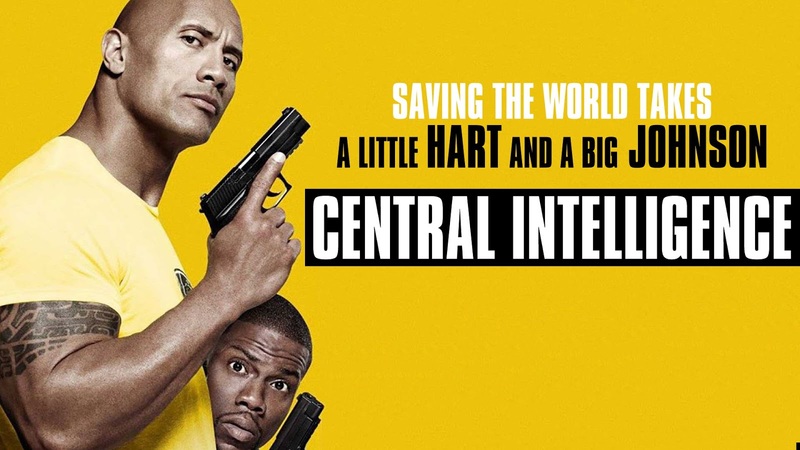 The film stars Kevin Hart and Dwayne Johnson as two old high school friends who team up to save America after one of them joins the CIA in order to save the world from a terrorist who has an intention to sell satellite codes. Amy Ryan and Aaron Paul also star. The film premiered in Los Angeles on June 10, 2016 and was theatrically released in the United States on June 17, 2016. Central Intelligence received mixed reviews and grossed $215 million worldwide against its $50 million budget." "In 1996, student and star athlete Calvin Joyner (Kevin Hart) is being honored at his high school's senior assembly. Halfway through Joyner's speech, Trevor Olson (Jason Bateman) and a group of bullies grab young Robbie Wierdicht (Dwayne Johnson), who is showering, and throw him into the hall where the assembly is taking place while he is naked. Calvin then takes off his golden jet varsity jacket and gives it to Robbie who thanks him. Everyone except Joyner and his girlfriend, Maggie Johnson (Danielle Nicolet), laugh, and Wierdicht exits the hall embarrassed. Twenty years later, Calvin is married to Maggie and works as an accountant but is dissatisfied with his career. Maggie suggests they see a therapist to salvage their deteriorating marriage. At work, Calvin receives a friend request on Facebook from a man named Bob Stone, who reveals that he is Robbie and requests that they meet. Calvin is shocked to see that Robbie has transformed into a muscular, confident man. Bob asks Calvin to review a few accounting records. Calvin deciphers the records as multi-million dollar transactions from an auction, with the final payment set to be made the following day. Bob avoids Calvin's questions and spends the night on his couch. The next morning, a group of CIA agents led by Pamela Harris (Amy Ryan) arrive at Calvin's house in search of Bob, who escapes. Pam warns Calvin that Bob is a dangerous rogue agent who intends to sell satellite codes to the highest bidder. As the CIA agents follow Calvin to his office, Bob abducts Calvin and explains that he is trying to stop a criminal known as the Black Badger from selling the satellite codes but needs Calvin's skills as a forensic accountant to find the coordinates of the deal's location. They are then attacked by a bounty hunter; Calvin flees and calls Maggie, telling her to meet him at the marriage counselor's office. Pam intercepts him and informs him that Bob murdered his partner Phil Stanton and is the Black Badger himself. She warns him to refrain from telling Maggie and gives him a device to alert them to Bob's location. Calvin then arrives for marriage counseling, where he finds Bob posing as the counselor. Bob convinces Calvin to help him, and Calvin sets up a meeting with Trevor, who is able to track the off-shore account for the auction for the codes, so they can obtain the account number that reveals the deal's location. Trevor helps them and lies that he's found God, apologizing for the prank, only to laugh in their faces, bullying Bob again. As they leave the building, Pam calls Calvin and threatens to arrest Maggie if he fails to help them detain Bob. Calvin is forced to betray Bob, and the CIA arrests him. As Pam tortures Bob to get him to confess, Calvin decides to help Bob. He restrains Harris, and the two escape. Calvin deduces that the deal is happening in Boston and helps Bob steal a plane. In Boston, Calvin guesses that the deal must be happening in an underground parking garage. Bob enters the garage alone. When Calvin sees Pam entering the garage a short while later, he mistakenly assumes that she is the Black Badger and runs after her. He finds Bob meeting with the buyer and claiming to be the Black Badger. Bob shoots Calvin, grazing his neck, to keep him safe. Phil (Aaron Paul) arrives, revealing that he is alive, and claims that he is the real Black Badger. The buyer attempts to retrieve codes from both Bob and Phil, but the CIA arrives and a shootout begins, while Calvin grabs both codes and runs outside. He encounters Bob and Phil, who engage in combat. Unable to decide who is the criminal, Calvin aims blindly and shoots Bob, allowing Phil to knock him out. Phil then confesses to being the Black Badger and reveals that Bob is innocent. Calvin causes a distraction and allows Bob to rip Phil's throat out, killing him. The two deliver the codes to Pam, who then drops them off at their high school reunion. Calvin reconciles with Maggie and, alongside Bob, they walk in to the reunion. Bob is announced as the Homecoming King, with Calvin revealing to Maggie that he hacked the voting system to ensure Bob's win. Trevor attempts to bully Bob a third time, but Bob knocks him out. As Bob delivers his speech, he relives his most embarrassing high-school moment and takes off all his clothes confidently. He walks off stage to unite with his high school crush Darla, and they kiss. During the ending credits, Maggie is revealed to be pregnant and Calvin has joined the CIA. Bob gives Calvin back his varsity jacket from high school on his first day."